Interlink’s many years of experience with the community newspaper market has grown to include more than 1,500 daily and weekly newspapers. Becoming the most widely used circulation management service was made possible in large measure by our customers recommending us to their publishing colleagues. Today our clients include key industry leaders such as NNA’s postal guru and Landmark executive, Max Heath, and many current and past elected leaders of state and national publishing organizations. This level of dialogue with the industry has made it possible for Interlink to go well beyond creating and supporting what is today the only USPS-approved circulation-focused service for community newspapers. Interlink’s software-based service makes it possible for a clerk to handle your total circulation—everything from billing a renewal to taking the last penny in postal discounts—all without being either a circulation expert or a postal wizard. Higher productivity, reduced training time and typically stunning postage savings are the immediate payoffs for publishers who choose Interlink. For the long term, choosing to establish a continuing service relationship with Interlink guarantees that all vital circulation services will be available far into the future. Interlink, like its clients, accomplishes its goals with a combination of in-house and contract staff. Typically a dozen people are available to tackle tasks on behalf of and to support all of our commitments to our clients. Located in a university community, we have an advantage in meeting our staffing needs as we continue to grow. Interlink offices are located in a business complex constructed in 1998. These facilities include more efficient work areas and superior networking and phone systems. Interlink’s communication system includes more than 10 Centrex phone lines plus a high-speed T1 connection to the Internet. The office computer systems include the latest Windows and Linux servers to manage files, Internet access, and internal and external email. Interlink’s web servers are positioned internally and externally for maximum reliability, performance, and security. Interlink’s birth certificate is dated February 1980. Its gestation stretched through the late 70s. At the time, co-founder William Garber, Ph.D., was chairman of the communication department at Andrews University and was looking for a way to provide electronic writing and editing experience for his journalism students—for a lot less than a $35,000, 4-station Rockwell editing system, then the least expensive technology available. Micro processors were just beginning to create $1,000 hobby computers. These systems clearly had the power to be editing stations, given the right software. Encouraged by the academic vice-president, who in 1979 told Garber that “a university is not an entrepreneurial organization,” it was obvious a private business venture was at hand. At the time, Garber’s brother Jim, then a computer programmer and system manager at the leading Dayton, Ohio, hospital, was eager to leave corporate life. The two Garbers and a cousin, Edward Lugenbeal, a seriously brilliant contemporary with both a Ph.D. in anthropology and a Bachelor of Divinity degree and who was about to leave his position, put up $2,500 each and created Interlink, Inc., specifically to build a computer system for community newspapers. That first Interlink system was designed on the Commodore Business Machines 8032, a system that along with the Apple II helped drive IBM into the personal computer market. Interlink’s Publish-ER7 system did exactly what William dreamed. Jim wrote a tight little editing program that handled stories up to 3,000 words in length, stored them on diskette in a file system that used common English names that were easily manipulated on screen, and then sent these stories to just about any photo typesetter of the day through interfaces designed and built by Interlink. The systems were so simple they could be shipped to a new customer, who personally hooked up the system to a Compugraphic typesetter, and was able to begin operations all without an Interlink representative ever visiting the shop. That commitment to simplicity continues to be the cornerstone of Interlink’s software today. Of course, having the computer already in the shop begged for it to also be used for billing the advertising and mailing the papers, two more software elements in the Publisher-ER7 system. In fact, the Ad Billing software was first created for a publisher more than 400 miles away in Northern Wisconsin, who met the Interlink staff once, when the offices where still in Ed’s basement. He was spending $3,500 monthly for a service bureau in New England to bill the clients for his five shoppers and a newspaper. Interlink did a system at the time for $15,000 that gave him full in-house control, cut turn around time, and eliminated a huge amount of hand work. Later the publisher reported that when he told the service bureau that he was going to manage over 3,000 advertising accounts on a personal computer using floppy diskettes, the service manager asked him what he was going to do when the system didn’t work. He said, “I told him, ‘I guess I will have to come crawling back to you. But Bill Garber said he can do it and I believe him. '” Of course, he got his bills out on time the very first month and he never had to make the call. In the beginning, it was simple. Design a system and then sell as many of them as possible. And that is a failing business model in a market with a limited client base. It was as though he was looking at the Compugraphic model. They first designed a system for newspapers, moved on to offices when the newspaper market was burned over, and fell victim to desktop publishing software on a general purpose computer system which did to them what they had done to Linotype. Had Interlink stayed with just electronic writing and editing, their original vision, Apple’s desktop publishing software would have killed the company. After Publish-ER7, Interlink transformed itself into a system integrator, using its billing and circulation software as the core of systems that added off-the-shelf editing software and hardware. At this point Interlink was generating repeat business as annual service conracts. This was an important evolutionary step for Interlink, once again in direct response to publishers needs and still very much in the community newspaper market. As publishers became more computer “literate,” as the term of the day was, they truly needed less system help. Their independence was further encouraged by the new computer industry model, pioneered by Dell and imitated widely, whereby factories sold computers directly to users with no dealers or distributors involved. It was time for Interlink to refocus, this time exclusively on software, specifically the software which had played the key role at every stage of Interlink’s business life. Free of hardware, Interlink became more sharply focused, and industry changes made it possible to create substantially more value for the client. By the mid-1990’s, the US Postal Service was well along in its drive toward moving much of the hand work out of the hands of high-priced postal workers and onto the computer systems in their clients’ mail rooms. The postage savings were so dramatic that postal discounts for presorting the mail inevitably more than paid for the Interlink systems that did the work, and still does. With clients producing more than 1,500 publications, Interlink’s experience is duplicated nowhere else. However, the evolving industry means learning must never stop. What guides Interlink is the clear understanding of the business model followed by almost every failed vendor to the newspaper industry. The historical perspective began during William’s university years. He needed typesetters for the school newspaper. He knew he had to buy used because the paper couldn’t afford new. So he teamed up with the graphic arts department and went looking for typesetters. That’s how he met the production manager of the Muskegon Chronicle who had two TXT photo typesetters he was trying to sell. These were $75,000 machines less than 5 years before and he sold them for $2,000 each. It took a fork lift to load and unload them. Like the Chronicle’s editorial system, the typesetters were no longer being made and the company was out of typesetting. Both vendors had fallen victim to a business model that depended almost 100% on new sales. So when the market veered, sales tanked and the business went down. Understanding those failures and our early foray down a similar path has inoculated Interlink against that business disease. By contrast, today’s Interlink business model is founded on a strong on-going license and service relationship, generating a continuing revenue stream. This has become an important sales tool. Once again, let us explain by illustration. Soon after moving to software exclusively, a new publisher who had recently taken early retirement from the Baltimore Sun became an Interlink client. It was later that he told us specifically why he chose Interlink. He said that he clearly understood our annual service plan and it was that plan that is the key point that sold him on Interlink. He said it was more than just service. It was the continuing revenue stream that would sustain Interlink in the future that convinced him he was making a safe choice. He explained that he had acquired too many systems that had become orphans following the new system sales starvation death of the parent vendor. Interlink clients, through their licensing and service agreements with Interlink, are not only guaranteeing that current service will meet all immediate needs, they are also guaranteeing the future viability of their circulation system. Interlink’s business model also streamlines client budgeting and avoids unexpected client expenditures. 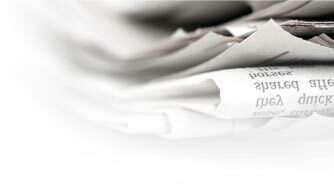 Interlink believes that newspapers will be printed for decades to come. Circulation management will continue to include all of today’s tasks as new or evolving technology and demands sweep over the circulation component of the publishing world. Reproduction is getting better and better, while growing equally less costly. However, distribution and subscriber relations are becoming increasingly more complex and demanding. In the postal area alone, refreshing your lists is already on a 60-day cycle. We anticipate that soon it will be totally online and in real time! In the end, we believe that the paradigm shift facing newspapers will not be from atoms to bits. The shift will be from technology as system to technology as service. Interlink has already made that shift on behalf of its clients.